Have you ever thought about how easy we have it today with bicycling shorts? Well, it’s certainly been a long, hard road, with many hills and valleys to conquer. Most fashions back in the day weren’t really designed with sports in mind, especially cycling shorts for men and women. In the late 19th century, it was pretty much the norm that men play tennis in long flannel pants, and they probably still would if it weren’t for Henry “Bunny” Austin, the first man to wear shorts at Wimbledon in 1932. Women had it worse, as they were required to wear full-length dresses for decades on the court, until Suzanne Lenglen wore a skirt that exposed her calves in 1919. American Gertrude Moran pushed the envelope a bit further in 1949, when she appeared at Wimbledon wearing a short tennis dress with ruffled, lace-trimmed knickers, which led the media to call her “Gorgeous Gussie.” Change was bound to come in terms of athletic dress. Bicycling back in the 19th century was clearly more of a fad than an actual sport. There was obviously no proper cycling attire for women back then…they more or less had to wear their daily clothes, meaning heavy dresses, primarily made of wool or cotton. 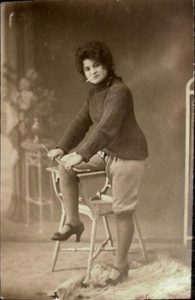 In fact, even before bicycle shorts existed, it was considered shocking for women to even ride a bicycle, or even show their ankles, which could lead to horrible things…such as smoking and maybe even dancing! In today’s world where most bicyclists wear shorts and padded gear, no such thing existed back then…kind of like our early 20th century tennis players. Now, imagine these heavy, flowing skirts as the norm, eventually becoming an encumbrance and causing accidents where the skirts’ many layers would get caught in the chain…and this is years before safety helmets. So, in an attempt to avoid any potential catastrophes, women rode sidesaddle, which sort of made pedaling a tad difficult. And even worse, with all of that heavy clothing, just imagine the saddle sores…if only they had some chamois cream! A woman in the early 20th century demonstrates the liberation of bloomers over a heavy skirt. Photo Courtesy of ilikethethingsilike.blogspot.com. The bicycle was one catalyst that helped women gain some sort of independence. 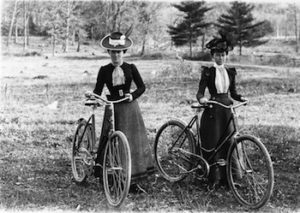 Cycling would be seen as a revelation of sorts for women, as it progressed from a novelty into a popular activity or sport, along the lines of baseball and basketball. The situation of inconvenient skirts would become resolved with the advent of a baggy type of pantaloons, aka bloomers, which allowed women to have greater freedom while riding. But, bloomers, while fashionable for the time, would inevitably be short-lived. What also helped to circumnavigate the inconvenience of cycling in skirts was the step-through frame (aka ‘women’s bike’), which allowed for women to ride while wearing skirts; this design also made it easier for them to dismount. In retrospect, the step-through frame has been seen as a safer design for riders, as it gives them overall greater opportunities to avoid injury…but let’s get back to bloomers, shall we? While bloomers were incredibly popular in the early 20th century, they eventually led the way towards bicycle shorts. There was just one problem: they were originally made out of heavy wool, which made for an incredibly uncomfortable ride. Can you even begin to imagine the chafing and saddle sores one would experience back then? As wool shorts caused such issues, there was much experimentation, including using the hide of a chamois, a European species of goat antelope, whose incredibly soft leather would eventually save many a bruised tush over the years. The chamois was important, and remains a crucial feature of today’s bicycle apparel. It wouldn’t be until the late 1950s that Spandex made its first appearance, which inevitably revolutionized the whole world of athletic ensembles and got rid of bloomers and wool shorts once and for all. Amen!